Celebrity dentist, Dr. Kevin Sands, is always working on the brightest smiles in the business; and he has the Instagram page to prove it! In a recent interview on Bustle.com, our skilled cosmetic dentist shares his expertise on ways for everyone to get that mega-watt smile. Knowing that not everyone can afford the star treatment, in this interview Dr. Sands reveals his top six teeth whitening tips for some DIY options. Whether you are looking to pay to have it done professionally, or interested in simply doing it yourself at home, there are several things you need to know! For more information about teeth whitening, or to schedule a consultation with the Beverly Hills dentist himself, please contact us today. In an effort to save money, many people have begun trying DIY treatments for their teeth. Ranging from quick teeth whitening tricks, makeshift alignment trays, and homemade mouthwashes, we have seen just about everything. 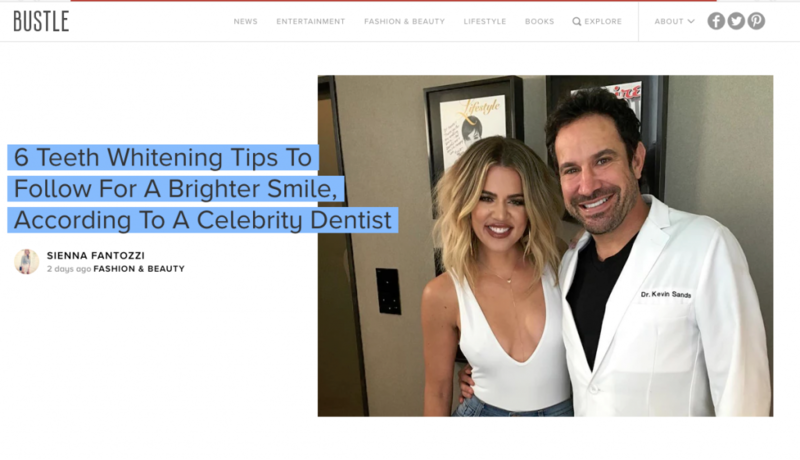 Our Beverly Hills cosmetic dentist, Dr. Kevin Sands, shares his expert opinion in his latest interview with Cosmopolitan.com. Here at his Beverly Hills practice, we offer a number of cosmetic dentistry options for your teeth that are guaranteed to be both safe and effective. Some of the popular “quick fix” treatments, although effective at first glance, can cause permanent damage to your teeth and leave lasting consequences. Before you believe everything you read and see on the Internet, Dr. Sands agrees it is always best to consult a professional. To learn more about the dental treatments available to best benefit your smile, or to schedule a consultation with Dr. Sands, please contact our office today. Our Beverly Hills cosmetic dentist, Dr. Kevin Sands, shares his expert opinion on the safest, most effective ways to get whiter teeth fast! Hearst Magazines, one of the world’s largest publishers of monthly magazines, has featured an article interviewing Dr. Sands in some of their largest media platforms. Take a look at the links below and learn more about Dr. Sands’ top do’s and don’ts for optimal teeth whitening. Seventeen, Esquire, Woman’s Day and Cosmopolitan! Many of our patients desire the opportunity to achieve a more beautiful, youthful smile and are excited to learn of the benefits of a smile makeover. Since a smile makeover involves the combination of multiple cosmetic dentistry treatments to address a variety of concerns, the ultimate costs associated with the procedure vary from patient to patient. During the consultation process, Dr. Kevin Sands will review your smile makeover options in detail, allowing you to make an educated decision about your teeth and gums. At that time, he can begin to create your customized treatment plan. A member of our team will then come up with an overall cost estimate and talk with you about your payment options. Dr. Sands is an extensively trained cosmetic dentist and has helped many patients completely renew their smiles! For more information about smile makeovers, or to schedule an appointment with Dr. Sands, please contact our office today. The appearance of our smiles can make a big impression when meeting people for the first time – and significantly impact our own self-confidence. A smile makeover can comprehensively rejuvenate your smile by renewing both the health and appearance of your teeth and gums. 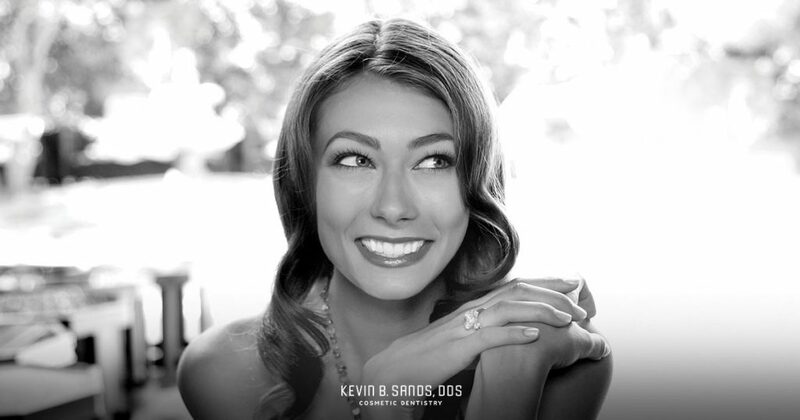 By combining a number of popular cosmetic dentistry procedures, Dr. Kevin Sands can give you the smile of your dreams. Your smile makeover will be customized to meet your individual needs and expectations. Depending upon your unique concerns, Dr. Sands will incorporate smile makeover options that may include: Zoom!® teeth whitening, Invisalign® clear teeth aligners, tooth-colored fillings, or dental implants. Dr. Sands is also extensively trained and experienced in the use of porcelain dental veneers as part of a smile makeover, which can repair the appearance of chips, cracks, gaps, stains, and even mild tooth misalignment. Take a look at our Smile Gallery to see before-and-after photos depicting results of many cosmetic treatment options that can be included in a total smile makeover. To learn more about your smile makeover options, or to schedule a consultation, please contact our office today. Our Beverly Hills cosmetic dentist, Dr. Kevin Sands, knows that significant teeth whitening can be an arduous process if not done correctly. In this most recent interview with Total Beauty, Dr. Sands details some helpful tips on how to quickly whiten your teeth and maintain that glowing smile you so desire. You’ll be surprised by some of your everyday activities that could be helping, and hurting, your efforts at getting those pearly whites! In this interview, Dr. Sands shares some of the main perpetrators behind the yellowing of teeth. These include some surprising foods you should continue to indulge in, as well as which to avoid, and some shocking things you could be doing (such as brushing too much!) that could be doing more harm than good to your teeth. As always, professional opinion and consultation by a highly trained cosmetic dentist is the best route to avoid any damage to your teeth and gums. Learn more about your dental options with Dr. Sands and which treatment can best benefit your smile. If you would like more information or to schedule an appointment, please contact us today. Is Teeth Whitening or Porcelain Veneer Treatment Better for My Goals? If you are looking for options that can give your teeth a whiter, fresher appearance, teeth whitening and porcelain veneer treatments are some of the most popular cosmetic dentistry procedures available to accomplish those goals. However, they are very different techniques and one may be better than the other, depending on your unique needs. Teeth whitening offers a minimally-invasive way to lighten your teeth by several shades, addressing yellowing and discoloration that can build on the teeth over time. This procedure can give the teeth a beautifully whiter appearance and provide you with a wonderful new reason to smile. With that in mind, professional teeth whitening treatments are not often very beneficial for teeth that are affected by deep stains, and the results – while potentially long-lasting with the proper care – are not permanent. Porcelain veneers can address more severe signs of staining and discoloration with results that can last for decades. They can also improve the appearance of other common dental imperfections, such as gaps, chips, and even mild cases of misalignment. Porcelain veneers are customized dental restorations designed to mask the visible part of affected teeth. They have the ability to completely restore the appearance of your smile and give your teeth a much whiter, healthier appearance. That said, porcelain veneer procedures are more invasive than teeth whitening, and may require the original tooth to be slightly reshaped in order to provide the most natural fit and appearance for the veneer. View our smile gallery to see before-and-after pictures of our patients. Both porcelain veneer treatments and in-office teeth whitening have proven to be extraordinarily effective for patients who want to renew the appearance of their smiles. It’s just a matter of determining which is best for your individual needs and goals. When you meet with our experienced cosmetic dentist, Dr. Kevin Sands, he will explain all aspects of the procedure you are considering and help you decide the best option. If you have any questions, please don’t hesitate to contact us and we’ll be happy to talk more with you about what you can expect! Some patients, particularly those who already have sensitive teeth, express concern about experiencing discomfort after an in-office teeth whitening treatment. Fortunately, there are some things you can do to reduce the potential for significant tooth sensitivity following a professional teeth bleaching procedure. If you already know you have sensitive teeth, it’s a good idea to use oral hygiene products that are specifically made to lessen the risk of pain from tooth sensitivity prior to your teeth whitening procedure. Also, be sure to clean your teeth and gums with a soft-bristled brush and make soft circles during the process. Brushing too hard may increase the likelihood of irritation from the chemicals present in the bleaching solution. Since bleaching agents often contain peroxide to give the teeth a whiter appearance, the chemical may inflame nerves in the teeth, which can cause a temporary uncomfortable reaction to cold temperatures. By following Dr. Kevin Sands’ directions, using appropriate oral hygiene products, and limiting your intake of excessively hot or cold food and beverages immediately after treatment, discomfort can often be greatly minimized. Over-the-counter pain medication can also help reduce any pain after the procedure. If you are using an at-home whitening product and are experiencing significant discomfort, it may be best to reduce the frequency of its use – and you should always consult your dentist on best practices for at-home teeth whitening treatments. View before-and-after images of some of our patients. Once you meet with Dr. Kevin Sands for your initial teeth whitening consultation, talk with him about your teeth sensitivity and the ways in which you can avoid discomfort once the treatment is complete. Our experienced team wants to help you brighten your smile in the most comfortable way possible! Professional teeth whitening treatments are known for their long-lasting results, particularly in comparison to over-the-counter whitening options. Here at the practice of Dr. Kevin Sands, we offer Zoom!® Teeth Whitening, one of the most popular in-office treatment techniques available. In many cases, the results of teeth whitening at our practice can last from six months to two years. Some patients have even experienced the benefits of teeth whitening for even longer periods. One of the keys to extending the results of the procedure is to maintain proper care of your teeth. Avoiding an excess of coffee, red wine, tea can be very helpful to reduce the chance of significant yellowing and discoloration. Additionally, foods such as blackberries and blueberries can stain the teeth, and too much of them can diminish the effects of teeth whitening at a faster rate. Quitting smoking can also go a long way toward keeping your teeth looking whiter for a longer time after professional teeth whitening treatment. Plus, occasional touch-up teeth whitening treatments can keep the effects going for years. View our celebrity smile gallery. During your teeth whitening consultation with Dr. Sands, he can talk with you about the best ways for you to take care of your teeth and maintain a whiter, brighter smile for a long time to come!